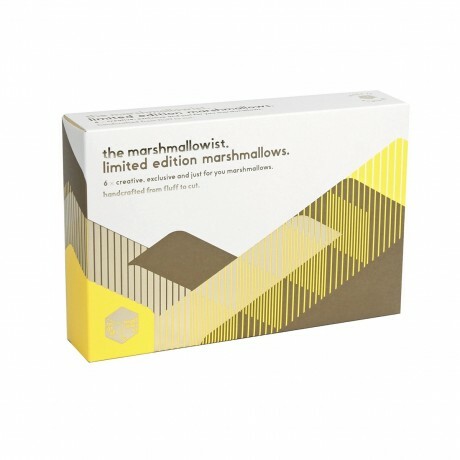 The Marshmallowist's Cannabis, Grapefruit and Pink Peppercorn flavour-of-the-month is causing a real buzz. Gourmet marshmallows crafted with organic cannabidiol (CBD), the non psychoactive extract of Cannabis. 1000mg full plant CBD oil was carefully selected to create this unique treat. Then combined with fresh grapefruits and pink peppercorns to give the flavour a delicious citrus lift and a touch of spice to complement the botanical notes of cannabis. The CBD oil is developed with nano technology providing exceptionally high bioavailability and is said to give a therapeutic effect that you feel upon eating. Each marshmallow contains a minimum of 3 drops of Cannabidiol. Carefully handcrafted from fluff to cut. The Marshmallowist were the first producer of gourmet marshmallows in the UK, and they specialize in the natural, the creative and the fresh. They only use premium ingredients such as Fair-Trade British Sugar, fresh fruit and organic herbs to make their marshmallows - never any flavourings or additives. The box is 120g and contains 6 signature marshmallows. They are egg white free, dairy free & gluten free and suitable for pescatarians. Shelf life: minimum 2 months upon delivery. Store in a cool, dark place away from strong flavours. Not to be eaten when pregnant. sugar, glucose, invert sugar, fresh pink grapefruit, FISH gelatine, glycerin, pink peppercorns, full spectrum hemp CBD extract 1000mg strength, cornflour, icing sugar. Allergens shown in bold. May contain traces of nuts. Not to be eaten when pregnant. The mallows were absolutely delicious, unusual taste fruity and fresh. The packaging is eye catching and I would buy this product over and over again!! A great gift and a wonderful taste. Gourmet marshmallows handcrafted with a touch of the unexpected.